This past week, this refreshingly upbeat MSNBC piece, Law Grads Going Solo and Loving It (BTW, congrats to my fellow blogging colleagues, Susan Cartier-Liebel at Solo Practice University and Aaron Street at Lawyerist for the mainstream mention) has been receiving tons of buzz in the form of tweets and social media pass-arounds but very little substantive discussion by bloggers. I’m on vacation, so I don’t have much time for extensive comment myself – but I wanted to focus on the aspect of the article that’s generated the most controversy in the comment section. Specifically, how realistic is the experience of Damon Chetson the North Carolina solo profiled in the article who says he earned more last year (essentially, his first year of practice right out of school) than the $150,000 to $160,000 that a big law associate makes? The question is important for new lawyers for several reasons. First, these numbers are necessary to enable new solos to evaluate their prospects of success. Second, understanding the basis for these numbers is important for solos who aren’t making nearly as much. Sure, a $150,000 salary out of law school is inspiring to new lawyers and gives them hope that there’s a chance for a great life in the law even if they can’t find a job working for others. On the other hand, for the new solos struggling to get by, seeing a lawyer making $150k out of the gate can be discouraging and demoralizing – you may wonder what you’re doing wrong. So it’s important to compare apples-to-apples to see if Chetson’s situation would really work for yours. For starters, based on my own rough calculations, and Chetson’s own discussions here, I’m fairly sure that his numbers are indeed plausible (some commenters suspected puffery). According to Chetson’s website, he charges between $2000 and $3500 for most DUIs, $1000 to $3500 for misdemeanors and felonies start at $2000 – and he says here that his website grossed him $200,000 in clients. At $2500 per case, that’s around 80 cases per year – or about seven per month. Those are completely reasonable numbers if a solo is leveraging the web. But the big question is….can Chetson’s success be replicated by other solos? That’s not entirely clear. Here are some of the contributing facts I’ve identified. 32 out of 50 for lawyers per capita nationally. Fewer lawyers means less competition which doesn’t guarantee success, but can improve the odds. North Carolina markets aren’t as saturated online as many urban markets like New York so generating results from the Internet is easier. Second, despite an extensive online presence, Chetson has a brick-and-mortar office behind him, which may also contribute to his business by adding credibility and making it easier to take on support staff. Personally, I think a virtual or home office is a great solution starting out. I’ve worked from one myself and I think that they’re the best solution for the early years of a practice. But I’m not convinced that a virtual or home office alone will work for the long haul for all practice areas, particularly one like criminal law or other practice areas where you need support staff or have walk in clients on a regular basis. In North Carolina, rent is cheap — but it can be very pricy in other states – and could take a bite out of newbies’ early profits. Chetson started a firm out of law school…but he’d been in the working world ten years prior. Granted, he apparently worked in an entirely different field, and he did take out $90k in loans. However, work experience in another field can help open doors and generate contacts. In addition, a working spouse or partner can make a difference since they can cover living essentials while leaving a new solo free to invest in their practice. I’m not saying that solos who aren’t married can’t succeed- absolutely not. But certain factors make starting a firm easier or harder. Certainly, not having any debt out of law school is one such factor, as is the ability to take clients from a former firm or not having to pay health insurance or living expenses because a spouse or parent can cover them. I think we all know that to generate big client numbers, you’ve got to advertise heavily – and these days, that means using the Internet. Chetson markets relentlessly and ruthlessly, and he uses most of the typical expert tricks. As discussed here, here, he’s got presence all over Google. 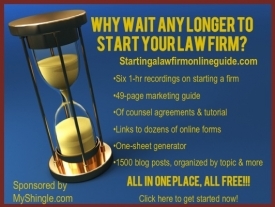 I’ve also found an Avvo Pro profile ($50/month – seems to be his most extravagant technique), a Better Business Bureau listing, a Lawyers.com listing (not clear if it’s free or fee) and a completely separate bankruptcy website (so much so that there’s no connection with the crime law site). The source code for Chetson’s web site is juiced up with SEO terms, and his blog is pimped out with keywords. His website is built for conversion, with a Google call me button and forms to fill out. I’m far from a marketing expert, but I know a market-centric web presence when I see one – and Chetson’s is a classic. Chetson is also diligent about gathering testimonials – he’s got a bunch at his site, on Avvo and Google – and by all accounts, he’s doing a pretty good job for clients. Again, it’s not clear whether Chetson’s homegrown SEO would work in crowded markets, but for his location in his part of the country, he’s decimating the field. Finally, it bears noting that Chetson’s done his SEO on his own, without professional, for-fee marketing services (though not sure about whether he uses Google ads). Paying several thousand dollars a month for SEO just starting out can also take a bite out of revenues. Still, for all his marketing efforts, Chetson is no Joseph Rakofsky, at least from what I can tell from his online musings. Chetson refers out those cases that he can’t handle. He doesn’t advertise outside of North Carolina, where he’s licensed. He seems genuinely committed to getting great results for clients, to learning from peers and to building referral relationships. Ironically, Chetson’s success online has helped to open doors with other lawyers – he can bring them cases, and in turn, they’ll return the favor or help him with his matters. Even so, some lawyers simply do not want to market like Chetson. Those lawyers who criticize these tactics aren’t envious or fearful of falling behind, as some of the lawyer-consultants would claim (honestly, most of those lawyers who are critical of online marketing have no use for the penny-ante cases that the Internet churns up). Rather, many of them believe, quite genuinely, that Internet advertising is tacky, cheesy and ultimately results in the wrong kinds of clients or a volume practice which is a tough way to earn a living. Even Chetson himself seems to realize that having succeeded on the low rent side, he needs to continue to build relationships with other lawyers to obtain higher-quality cases and to diversify his marketing portfolio. Whether Chetson can actually make the shift remains to be seen. Moreover, the Internet isn’t the solution for all lawyers. Though from time to time, I’ll generate leads from my website and online presence, most of my potential clients for energy regulatory matters aren’t Googling for lawyers. Certainly, consumer law practices can benefit from Internet presence but for other practices, the nexus between blogs or websites or social media and client generation isn’t as direct. Lawyers have always advertised in phone books, on TV and radio. What’s changed is that the Internet has made big-media tools accessible to new lawyers for pennies. The Internet may prove too potent a tool for some new lawyers (particularly one who’s made the rounds in the news lately) who forget that competence and ethics matter. And lawyers also waste the awesome power of the Internet to really educate clients about issues or to swap ideas that can move the law forward when they focus on keywords to the exclusion of any thing else. Still, despite the potential for mis-use, the Internet, used responsibly, does offer a lifeline to new lawyers who want to build a practice and provide quality legal service to clients. However, the Internet isn’t magic. There aren’t shortcuts. And it’s not a panacea either. For every new lawyer who pulls $150,000 earnings out of a hat after law school, there are dozens of others who barely earn $15,000. Moreover, the landscape does not remain static either. Today’s lawyers have a window of opportunity to leverage the Internet, but with SEO-pro services, that window may be limited – and DYI SEO efforts may be boxed out by pay-per-click and other big-money services. That’s why lawyers can’t afford to put their eggs in one basket – something that Chetson recognizes, but other newbies might not. So what’s your view? Is Chetson an exception – or are there lots of other new solos finding this same level of success out of the gate? Can Chetson’s success be replicated in more crowded markets, or by new solos who have $200k in loans or a worse financial situation? Can new lawyers succeed if they’re not willing to play the keyword SEO game – and how can they do so? What are you doing to build your firm? Please post your comments below.